Nottingham City Council has received a National Lottery grant to engage those with an appreciation of heritage within the city. The award of £26,800 will also shape the future development of the Nottingham Heritage Partnership. The partnership, which was launched in 2016, aims to enable people and communities to support each other and better manage, understand, enjoy and celebrate Nottingham’s heritage. Projects will be identified and developed through a community forum, and the partnership will help steer the delivery of heritage management in the city. Thanks to National Lottery Players, interested people in Nottingham will be able to shape the development of the Nottingham Heritage Partnership, supported by the City Council. The Heritage Lottery grant of £26,800 will help to map what heritage groups there currently are in the city. Through a series of events and workshops, the council wants to engage diverse and representative groups and individuals, with an appreciation of heritage, to come together and work out how the heritage partnership can work independently of the authority in the future. Peter Ellis, Chair of the Nottingham Heritage Panel, said: “This grant will make a real difference to the development of a Heritage Partnership, which will help to identify, celebrate and enjoy the heritage of our city. “We are very pleased with the support of the Heritage Lottery Fund and its recognition of the efforts by many people and groups across the city to recognise the wonderful history of Nottingham. The City Council is supporting the development of the Partnership. However, the activities of the Heritage Lottery-funded project will be carried out independently within the heritage community. The project also offers an opportunity for the City Council to provide advice about funding and projects, as well as enabling groups to network and provide each other with support. Councillor Linda Woodings, Portfolio Holder for Housing and Planning at Nottingham City Council, said: “We are really proud of Nottingham’s heritage which is both bricks and mortar and the stories, tales and folklore which has passed down through a thousand years of history. The aim of the Partnership is to create a diverse forum which represents all people in Nottingham and works with the Nottingham Heritage Panel to help deliver the Nottingham Heritage Strategy. 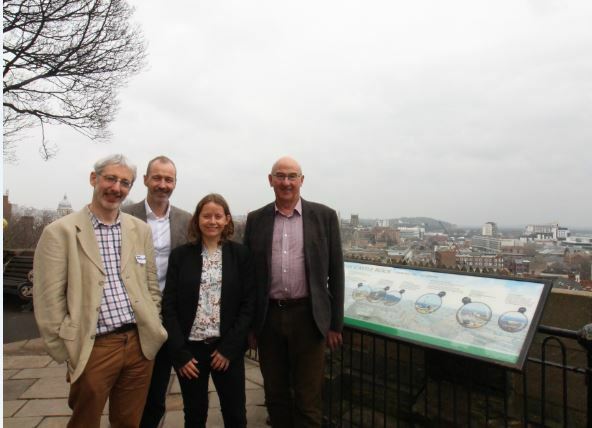 Nottingham Heritage Panel was set up following the launch of the Nottingham Heritage Strategy in March 2015. It is the steering group for the strategy and is made up of Heritage representatives to help give advice on Heritage Projects within Nottingham. Members include Historic England, the universities, Nottingham Civic Society, the Canal and River Trust and local Architects and Heritage Professionals.